The limestone caves of Italy's Sassi region have been occupied for millennia. From his home in Southern Italy, Vincenzo Altieri beholds a neighborhood that looks straight out of Biblical Jerusalem. The townscape springs from caves built 7,000 years ago into a wall of the Gravina River gorge. It’s called the Sassi, an Italian word for “stones” that reflects the fact that every surface, joint, and vaulted arch is made of rock. The district lies within the boundaries of Matera, a city in the midst of olive groves and wheat country above the Ionian Sea. Archeological evidence shows that people were settled in its caverns during the Neolithic era, which ended between 4,500 and 2,000 B.C. The caves remained intact through the Bronze and Iron ages and on into the first and second millennia A.D., when residents began using excavated stone to expand their homes, building rooms on top of the underground chambers. The sloping town survived plague, tyranny, and war, but today is seeing dramatic change as residents equipped with new technology are reinventing it. Inside the town of Matera in Italy’s Basilicata region, the Sassi district springs from limestone caves carved 7,000 years ago. The name, which means “stones,” reflects the fact that every surface, joint, and vaulted arch is made of rock. 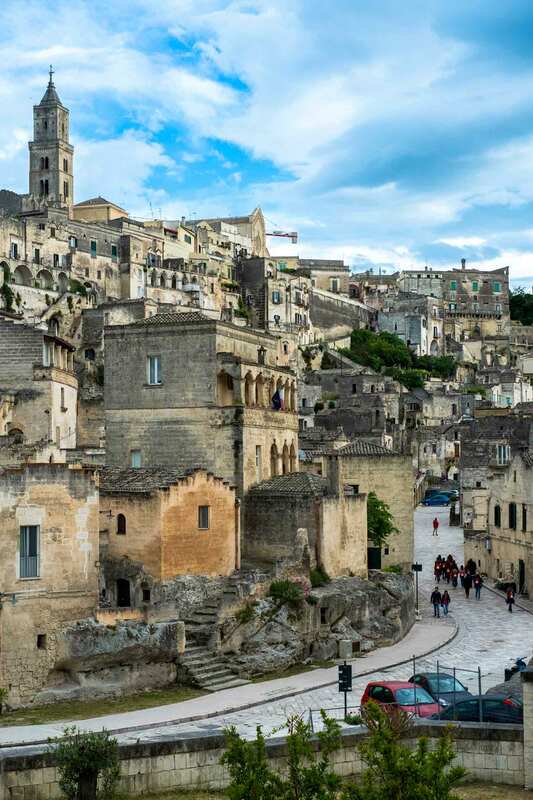 Through recent millennia, Sassi residents — farmers, shepherds, and craftsmen — spent most of their time outdoors, the men working outside of town in fields, the women and children gathering in courtyards with neighbors to make bread, wash laundry, and discuss the day. So efficient was its infrastructure and social life that as time passed, the Sassi changed little. Not even the Industrial Age – when cities elsewhere erupted with steel and glass – touched it. After World War II, as the rest of Italy modernized, the Sassi remained stuck in history. Few anticipated the jolt that would occur next. Past into present: In the mid-20th century, when the 1945 book written by Carlo Levi called “Christ Stopped at Eboli” described conditions in the Sassi, Italy woke to the fact that the city’s 12,000 residents dwelled in caves without basic services, and suffered high rates of malaria, malnutrition, and dehydration. Children were dying at a rate of 50%. Starting in 1952, the alarmed government began moving thousands of people out of the Sassi into new housing built on the plateau. Soon the stone city that had endured for 200 generations grew silent. A popular storyline circulates today describing how the Sassi residents were grateful to escape the town, but Altieri – who grew up living on the plateau above town and knew some of the previous villagers — says plenty were not so when they couldn’t recreate their tight community bonds in the new city layout. Cars and electricity bewildered some of them, and the individual houses isolated them. Some of the people pressured the government to re-open the Sassi, and in the 1990s, the government allowed people to move back into the area if they agreed to improve the houses to modern codes. Modern technology, such as satellite dishes, refrigerators and power lines, bring 21st century conveniences to the ancient city of caves. His home protrudes from a knoll on the cliff’s edge; he shares it with his French wife, Karla, and their kids. From their terrace, they can watch a ceramicist in the shop below selling bird sculptures to passersby, or they observe wandering tourists lose themselves in crooked passageways, or see neighbors hanging laundry on an outdoor line. What Altieri found when he opened the building for the first time was perplexing, even to an engineer. First he removed garbage and debris that had been sealed inside the walls for 30 years. Then he cleaned and fixed cracks and shored up crumbling walls. He installed bathrooms and opened up channels for electrical wires, water lines, and sewer pipes. Water, Air, Light: Since ancient times, the management of water, air, and light has been a feat. Because the rocky slope contains no naturally flowing springs, early inhabitants collected rainwater for domestic use. They built a primary bell-shaped cistern on the plateau above town and took turns transporting water down the steep lanes to their homes. Some built smaller cisterns close to home that they shared with neighbors. The cisterns captured water that drained from roofs and gullies through sequences of tunnels and clay pipes. Altieri’s cistern is inside of a wall that he shares with a neighbor. “I’m harvesting water,” he chuckles. Even when the Sassi district of Matera, Italy was just a village of caves, it was tough to manage water, air, and light. Today, window glaze and shutters fill holes once protected only by grills. 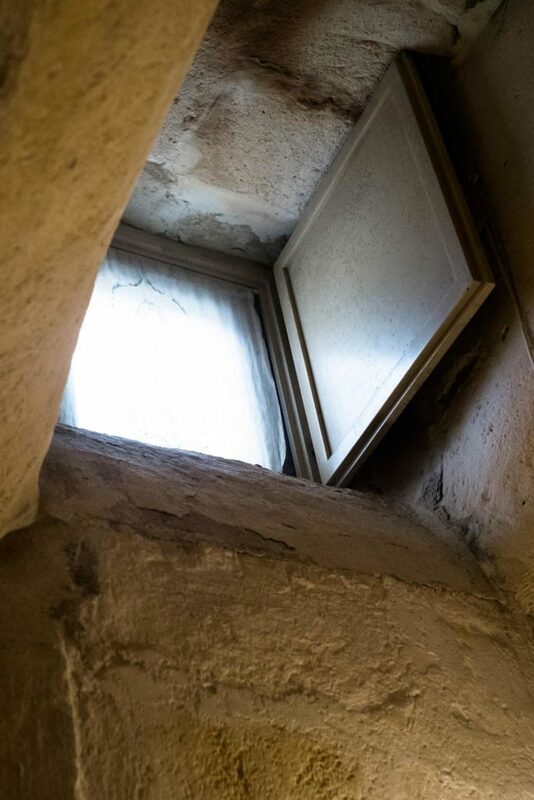 Altieri cleaned out wall nooks to use as storage and lighting shelves; he smoothed uneven floors and rebuilt stairs; he found thick wooden doors and iron hinges, and installed them as they were hung in Medieval times. The family quarters are on the second level: The front room is a kitchen that opens to the dining area, living room, and bedrooms. Beneath the home are several rock-hewn chambers which Altieri restored into cozy bedrooms and bathrooms. He opened his current business, La Dolce Vita Bed & Breakfast, where travelers get to sleep between walls of their primitive ancestors. These days, the Sassi is no longer hushed. 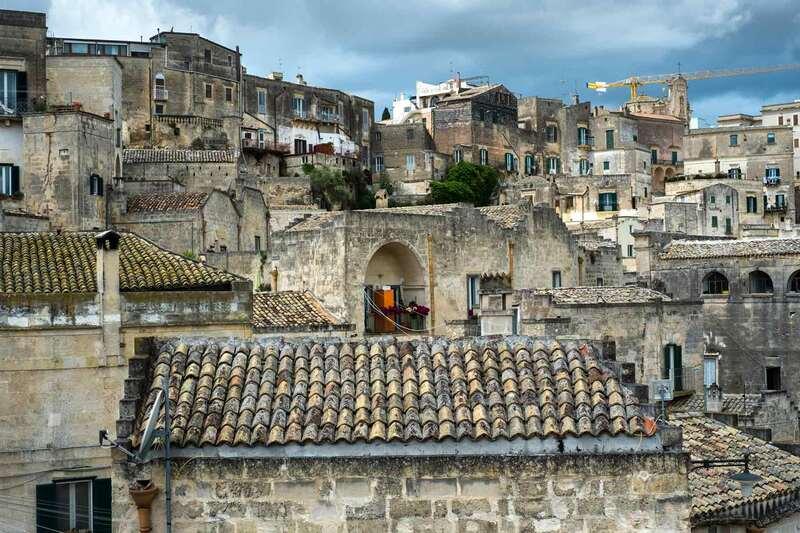 UNESCO made it a World Heritage Site in 1993, and the European Union recently named Matera a Capital of Culture for 2019, which means the district is seeing yet another resurrection, this one economic. With new hotels, craft shops and restaurants, the crooked lanes that were once as silent as stone, now echo with voices.